^ Orwell, George (1998). Davison, Peter. ed. I Have Tried to Tell the Truth: 1943–1944. The Complete Works of George Orwell. 16 (1 ed.). Secker & Warburg. p. 37. ISBN 0436203774. "George Orwell's payment book for 20 December 1943 records the sum of pounds 5.50 for a special article of 2,000 words for Tribune. This has never been traced in Tribune under Orwell's name but it now seems certain that an essay, entitled 'Can Socialists Be Happy?' by 'John Freeman' is what is referred to. The name Freeman would have appealed to Orwell as a pseudonym, and the article has many social, political and literary links with Orwell, such as the relation of Lenin to Dickens (the fact that Lenin read A Christmas Carol on his deathbed also appears in the second paragraph of Orwell's 1939 essay, 'Charles Dickens'). A 'real' John Freeman, later editor of the New Statesman, has confirmed that he did not write the article. The reason why Orwell chose to write as 'John Freeman' he never used this pseudonym again is not clear. It may be that Tribune did not want its literary editor to be seen to be associated with its political pages. Possibly it was a device that allowed Orwell to be paid a special fee. Or it may be that he simply wished to see how far Tribune would let him go with his opinions. In any case, the article appeared in the Christmas issue and provoked much debate in the issues that followed. The 'lost essay' is included in the Collected Works and printed here for the first time under Orwell's name." ^ Bradfield, Scott. "Orwell's every word: The Complete Works of George Orwell", Times Higher Education, 24 July 1998. Accessed 27 December 2009. ^ Crick, Bernard (2004). “Eric Arthur Blair [pseud. 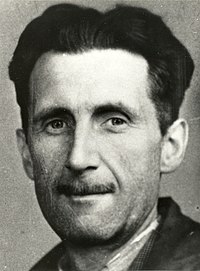 George Orwell] (1903–1950)”. Oxford Dictionary of National Biography. Oxford, England: Oxford University Press. ^ Stansky,, Peter; Abrahams, William (1994). “From Bengal to St Cyprian's”. The unknown Orwell: Orwell, the transformation. Styanford, CA: Stanford University Press. pp. 5–12. ISBN 9780804723428.